Professional 400 anti-UV lens, can effectively filter the blue light which are reflected by sea water and blue sky,it’s more suitable for casual ã€seaside and water sports. It’s main function exists in preventing eyes from undefined objects. It can also be worn at night to prevent mosquito and other flying into your eyes. It’sthe most personalized lens, with high-density revo coating, keeping the original color, improve visual clarity and contrast effectively. 1. Flattering lines and aesthetically pleasing appearance.Comfortable and Soft, Lightweight and Comfortable for Prolonged Wearing. 4.Multiple Coated: Polarized, Anti-fogging, Waterproof, Full REVO, UV400 Protection, Anti-impact, Shatterproof. 5.Premium Material: The frame is made of PC. The lenses are made of PC. All material are unbreakable and flexible. 6. Widely Use: Our sunglasses are designed for driving, cycling, running, fishing and all other outdoor activities. [Durable Frame]- High quality Polycarbonate material and durable enough for long time using,which restores the no-glare real world to you, help reduce eye fatigue and ensures your eyes’ safety of all kinds of outdoor activities. [Ergonomic Design]- Durable waterproof and soft can fit your nose well and give you the best wearing feelings. It will stay in place and will not slip when you cycling or skiing, just enjoy sports without any worry. 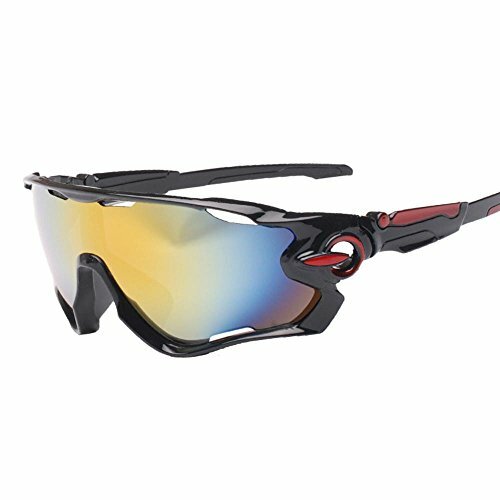 [Wide Application]- Cycling Glasses ski sunglasses can used for men and women, Lightweight design is ideal for usage by cycling, motorcycling, driving, fishing, running, racing, climbing, trekking, riding, golf, baseball, softball, volleyball, shooting, hunting, skiing or other outdoor activities enthusiasts. [Service Guarantee ]- 100% satisfaction guaranteed. We are not only selling sunglasses but also providing excellent customer service. We promise if you are not happy with our sport sunglasses within the first 30 days, we will refund you without any reason.